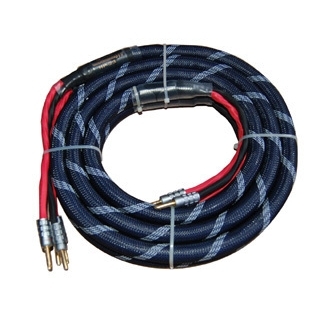 HP-23 speaker cable select multi-strand 5N high-purity oxygen-free copper to mold, balanced transfer for treble,mediant and bass. The cross-sectional area and surface area is large,reduce signal transmission loss and reduce skin effect of high-frequency signals. Plus there is damping low loss material, effectively reduce the vibration and interference between wires,reduce the sound pollution. Low-loss materials for insulating layer,make the wire be stable and reliable.T The wire perform full of low-frequency,full IF,balanced timbre.Signal terminal with locking device to ensure contact well,uses good quality fibre net to decorate the appearance, process is refined and elegant.